Test your operating skill on Oogie Boogie! The classic game of skill... with a silly, spooky twist! Features Oogie Boogie, Jack Skellington, and more from The Nightmare Before Christmas. This collector's edition of the classic game of skill gets a silly, spooky twist with your favorite characters from Tim Burton's The Nightmare Before Christmas. 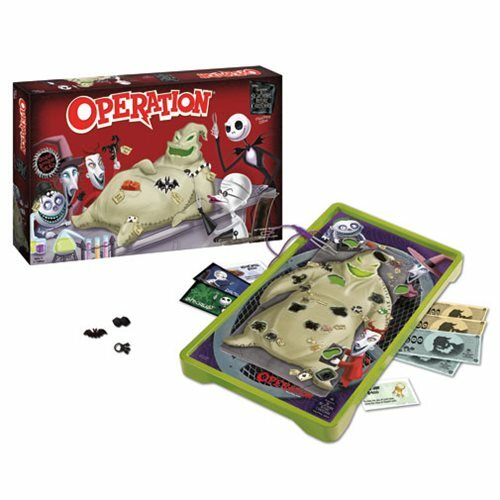 Test your operating skill and perform several procedures on Oogie Boogie... but watch out for the buzzer! 1 or more players. Requires 2x "AA" batteries, not included. Ages 6 and up.